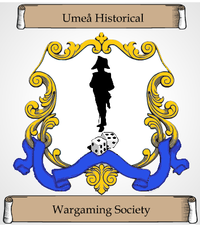 UHWS is a small group of wargamers and miniature painters concentrating on historical periods and gaming. We resides in the city of Umeå in northern Sweden. We have decided that a club/society for historical gaming is needed since the only local wargaming club are strictly interested in fantasy and also falls short in some other respects. The vision we have for our society is to create a serious and relaxed gaming club for mature gamers. The society is suited for those who have a genuine interest in history, miniatures, models and strategic wargaming. At the same time a responsible and respectful attitude that makes gaming and social activities pleasant and fun for all participating parties. A gentlemen's club if you wish. We have just started this project, but do note; that even if we warmly welcome new members that we think fulfil this description, stated above, we do not seek to create a large "free for all" club were everyone can join and then disrespect the rules of conduct, stink like they never had a shower, act like a kid or create a mess etc. We had enough of guys like that elsewhere, and that is why we need this club to be different.